Oh, the crap you inadvertently see when you're on an elliptical machine at the gym in front of a bank of televisions. Yesterday, the crap was The Marilyn Denis Show, which I take it is the Canadian version of whatever crap American housewives boredly half-watch at 10:00 on a weekday morning. (Tomorrow's episode features thoroughly debunked and shameless communicator-with-the-dead John Edward, which tells you everything you need to know.) On yesterday's show was some expert who was presenting a segment called "Busting Beauty Myths", myths on which the audience was invited to vote by means of little paddles with "True" on one side and "False" on the other. And the first proposition was that you should never, ever, EVER spray scent on your wrists and the rub them together, because you will bruise the scent. Everyone knows that! Except that it isn't true. How can anyone even think that's a possibility? It's a liquid. You can't bruise it: it's already been processed and compounded and bottled and shipped and toted hither and yon and finally applied to your personage, so it's been banged around in uncountable ways before it arrives on your skin. You can't bruise it. If you really get some friction going with one wrist against the other, you'll heat it up and drive off the top notes more quickly, but you're not going to alter the scent in any olfactorily noticeable way: you won't somehow rearrange the notes or cause the scent to morph into something else. You spray on some Jovan Wild Musk or Byredo Pulp and it's going to smell like that whether your smush it around on your skin or not. The expert goes on to say that you must spray the scent on and then leave it for eight minutes. Eight? Not six, not nine? Where did she come up with a number like that? And what are you supposed to do for those eight minutes, sit there rigid and unmoving for fear of damaging your freshly applied perfume? It's not nail polish. It's on your skin, and it's going to slowly evaporate, and nobody will ever be able to tell what you did in the eight minutes after you applied it, unless maybe you subsequently cleaned the toilet and didn't wash your hands. I don't know where people come up with these stupid ideas, but it's high time this one was laid to rest. Do what you want with your scent. Spritz it, dab it, splash it: leave it there or rub it in, put clothing over it or don't. None of these things matter. Promise. Spring is here, really here (at least in my part of the world), and so it is time to think about boxing up the dark, sultry fall and winter scents for a spell and digging out the fresher, brighter things that herald the new season. It is a pleasure for many of us to divide scents up into categories, and we don't all use the same ones, of course, but in addition to such groupings as men's/women's/unisex, spring/summer/fall/winter, and floral/oriental/chypre/fougere/whatever, I am fond of, for lack of better terms, intellectual versus emotional, or brains versus beauty. The two aren't mutually exclusive, of course, but often you can immediately say of a scent, This one is just flat-out gorgeous, or This one isn't the most beautiful thing I own, but it makes me think. Some scents just seem brainier than others: they're the ones that aren't immediately accessible or beautiful, the ones that put your cerebral cortex into overdrive before engaging your amygdala. * Many classic chypres for me fit into the intellectual category, because thanks to the general strangeness of oakmoss, a lot of the time you can't be absolutely sure that they're even attractive. A couple of days ago I wore Serge Lutens' Santal Blanc and was struck yet again by its almost mathematically rigorous quality, the naked, bitter stringency of its sandalwood: it's like wearing algorithms on your skin. A lot of Lutens' scents have an intellectual cast to them, because there's almost always at least one element that seems strange or unexpected or out of place, and this may be why his line resonates so strongly with me: I tend to analyze and possibly overthink everything, so his oeuvre fits right in. Some of his scents, of course, consist mostly of strangeness, such as Miel de Bois, which is a linear, relentlessly analytic working through of the life cycle of honey; naturally, I love it. 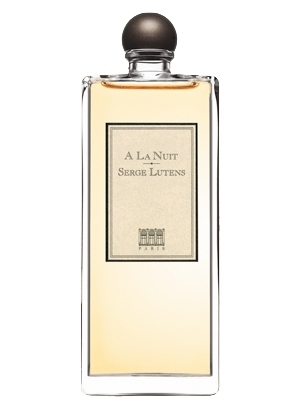 A La Nuit aims for the "beauty" side of the divide and is jasmine, basically: a huge, lush bower of jasmine petals. There is greenery in the top, and not only that but, because there has to be an injection of Lutensian strangeness or intellectuality, what seems to me the peculiar, inimitable scent of a green banana. The massively floral top also seems to have an overtone of lilac to it, which is like adding corn syrup to sugar because the sugar wasn't sweet enough by itself: I might be imagining the lilac because I'm suffocating in jasmine, but if it's there--the official notes don't mention it--it's a nice touch. The base is mostly benzoin, and not much of that. Other than that, though, jasmine unto death. I don't like it at all, because I can't handle that much jasmine, but if you like jasmine, or if you want to know what it smells like, then A La Nuit is just the ticket. *The cerebral cortex is the seat of higher brain functions such as thought and language: the amygdala is responsible for emotional reactions.That was probably clear from the context, but hey, if you didn't know for sure, now you do. Why do I update so much less frequently than I'd like? I dunno. Maybe I'm just a lazy sack of crap. Why has it taken nearly two weeks to write this? In part because for the last five days or so I have been clotheslined by a hideous, unending cold or possibly the flu or more likely both at the same time, maybe even some lab-grown strain of superflu. I've actually taken two days off work, which I never do. I'm really sick. Kevin over on Now Smell This has an essay on a subject that is ever swimming around in the brain of every olfactorily inclined man: can I fearlessly wear "women's" scents? I worry about this a lot less than most men, since easily half my collection is from the women's side of the aisle. I figure, if it smells good, I want to smell like it, and I don't much care what other people think. I worry a little, sometimes: I've made up little scripts including fake, masculine names for scents in case someone asks me what they're called. "Oh, it's Debonair by Truqué et Fils. Yeah, it's French. I bought it in Paris. No, you can't get it here. Very limited-edition." I have never had to use this. 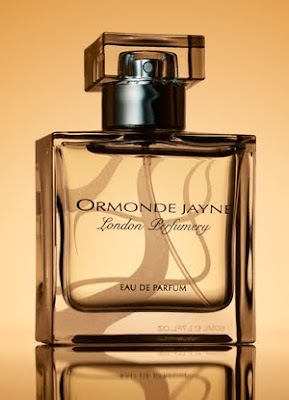 Ormonde Jayne Ta'if is a jewel of a rose scent, and that alone is going to make most people respond to it as a women's scent only, but I could wear it. I do wear it, and not just around the house: I've worn it to work over the last couple of weeks because I usually do when I'm thinking about a scent, and nobody has noticed or said anything. This is because it smells quietly astonishing. The opening is a bright, peppery eruption that cleverly makes a nod to its Middle Eastern provenance (Ta'if is a town in Saudi Arabia famed for its roses) with a few morsels of dates; it's not quite edible but it is delicious. There is supposedly saffron as well, and sometimes I have convinced myself that I can smell it, but I could be imagining that, just knowing it's supposed to be there. The middle is of course the rose: it is decked all about with other florals, mostly orange-blossom and jasmine, but the rose is front and centre, like a diamond which has been cut and set to show it off to maximum brilliance. And yet for all this, it is understated, close to the skin, and there are facets to the rose: now thorny, now fruity, now soft, now bold. It changes in the light. The third act is not as good: a rather uninteresting vanilla amber, that's all, nothing you haven't smelled before. It is an unfortunate ending to something so promisingly beautiful, but the first few hours of Ta'if are ridiculously beautiful. I don't know if I have a favourite rose, because I like so many of them, but this is near the top of the list, for sure, and worth what they're asking (a 50-mL EDP spray is currently £70, about $100, entirely reasonable). There is a tremendously interesting piece over on Slate about wine, and wine-tasters, and the eternal question of whether they're just making it up. And I sort of think they are, usually. After all, when wine is presented in black wineglasses, a significant number of people can't even tell if they're drinking red wine or white. This proposes all sorts of interesting questions when it comes to perfumery, and anyone who's thought seriously about it has come up with these questions. To what extent is our appreciation of scent bound up with our knowledge of their provenance? Do we generally like expensive scents better than cheap ones? Can we reliably tell the difference between cheap and expensive scents? I am certain that if you put some really insanely expensive scent like Clive Christian or JAR into a mass-market celebrity-fragrance bottle, then connoisseurs would think less of it, and conversely if you put something cheap but well-made into a costly-looking bottle and said the price was $225, people would think more highly of it than if it were dispensed it from the drugstore bottle. As I wrote about the original Parfum d'Hermes, when I smell it I can tell it's made of quality ingredients. Even if you put it in a cheapjack bottle, I am pretty sure I would still love it: I might express surprise that something so cheap smells so good, but I wouldn't disdain it. But of course something so good couldn't be made so cheaply: quality ingredients cost more than mass-produced oils and low-end synthetics, and sometimes the difference is immediately apparent to the nose. I don't think there's anything wrong with all this: it is normal to think of the packaging and even the advertising as being of a piece with the scent, and it's just as normal to treasure more highly something we've paid more money for. I think there are two lessons, though: we shouldn't be too willing to pay insane prices for scents just because they are expensive, and we shouldn't automatically disdain inexpensive scents just because they are inexpensive. My exceedingly long divagation on immortality last week brought a couple of comments in the form of questions, so we might as well have a look at those. They're two sides of the same coin, as far as I'm concerned. Seriously though, what makes you think there is time in heaven? Or that time is experienced the same way in heaven? Does time only exist because of memories? The answer to the first question is that most everyone else thinks there must be time in Heaven, and why should I be any different? The hymn that I quoted, after all, very specifically talks about durations of time, and this guy here seems pretty sure of it. The second question is a bit thornier, but I am confident that the answer is that human beings do not exist without time: our personalities, in fact, are made almost entirely of it. There is a degree to which our personalities are shaped by our own bodies--the way in which we receive and process data--but beyond that, our personalities are formed by our memories, and these require time to give them structure and meaning. Time, said Woody Allen, is nature's way of keeping everything from happening at once, and that's a joke but it's also completely serious; time is how we make sense of memories and therefore of our selves. The answer to the third question, then, is the reverse: memories exist only because of time. Maybe God's "gift" to everyone who enters Heaven is a type of "lobotomy" that erases your ability to remember what you did the day before....it wouldn't matter what order you did things in (or if you did the exact same thing(s) every day) because everything would be experienced as if it were new and exciting. That occurred to me, but I didn't get into this because I was writing a blog posting and not an entire book. If your personality is constructed out of your existence in time, then this sort of heavenly brain surgery will go a very long way towards obliterating that personality. Look at Oliver Sacks' stories of people who cannot lay down a short-term memory: some of the medical personnel and caregivers around them find themselves wondering if these poor victims of neurology even have personalities--if they are even really people. Let's go right back to the start. Even if you don't have conscious memories of the things you did when you were young, these helped shape you. Maybe you burned your hand on a stove: you learned not to touch hot things. You learned how to read and tie your shoelaces and tell time. You learned the names of people and places and things. And all of these things are trapped in time like insects in amber: their sequence, their progression through time, is what makes subsequent experiences possible. You know who your Aunt Doris is because you've met her before. If you don't have a memory of having met her, then seeing her again is like meeting her for the first time. But if she remembers meeting you but you don't remember meeting her, then you have a disconnect, an embarrassing social situation, and if this happens repeatedly, then you have a scary neurological problem. Everything in your life is built upon the previous experiences you have had, and this is what forms your personality. I saw a bunch of bad action movies: therefore, I don't like action movies. I had smoked eel once and it was pretty good, so I'll eat it again if it presents itself. These little things and thousands like them are what make you who you are. You know perfectly well that your body is not who you are, not really: you can watch all those movies and science-fiction stories about personalities being uploaded into a computer or brains being transplanted into different bodies, and it makes perfect sense, because your body is sort of a machine for lugging around your personality. If someone could give you a perfect body (whatever that means) or if you lost a limb, you'd still be you. Your body changes over time, sometimes through your own machinations and sometimes simply through normal aging; you can gain or drop weight, get some wrinkles, lose the use of a digit through arthritis. But you're still yourself. But if someone could magically alter your personality in some profound way, you know just as well that you wouldn't be yourself any longer. If someone could (surgically or supernaturally) make me, say, credulous and not cynical, or if they could make my every response to something be absolutely pleasant and even-tempered, never annoyed or angry or sarcastic or upset, then that might be nice for everyone around me, but I would no longer be me in any meaningful sense. We know this is true because brain injuries can change people's personalities in drastic ways: Phineas Gage had part of his brain ripped away in a railroad accident, and though he survived, he was a completely different person afterwards: his body and his name remained, but friends and family agreed that he was "no longer Gage". And yet this is what brains and therefore personalities in Heaven must surely be like, with everything disagreeable ripped away. It is fair to say that if life in Heaven is perfect, then you either have no bad memories, or they don't matter to you. In the first case, an important part of your self has been erased, because you are the product of all your memories, good and bad alike: humiliation and pain have as much of effect on creating you as comfort and pleasure. In the second case, you've been lobotomized. In either case, you are only a facsimile of you, not yourself, not really who you are--certainly not the person who expects to enjoy eternal bliss in Heaven. In Heaven itself, of course, if you can lay down memories, then we have all the problems I mentioned previously: storage space, tedium, and the sheer repetitive endlessness of eternity. Some will argue at this point that your new, heavenly brain won't have these problems, and I will again say that if that's the case, then you are not who you are now: your personality, your self, will have been transformed in such a way as to make you an entirely different person, in which case it's not meaningful to say that you're in Heaven: someone else is instead. If you have no bad memories, if you remember only every good thing that ever happened to you and will continue to do so, then in what sense are you yourself and not some mindlessly idealized Pollyanna version of you? If you cannot lay down memories, then you have a new and much, much bigger problem, which is that like Sacks' patients you are stranded in a permanent now. Do you love to read books? Do you think of Heaven as a colossal library? Everything you read yesterday will be gone from your head today, so you can't follow plots or arguments, can't form conclusions, can't learn and grow and develop. Do you want to spend time with your loved ones? Everything you did, every perfect experience you had with them, will have vanished into the ether when you awaken. People you met yesterday, things you did, experiences you had: gone, all gone. It's worse than a lobotomy: it's Alzheimer's for all of eternity.